Welcome to Daniel's affordable Coachella Valley carpet cleaning service. We have served Palm Springs/Palm Desert for over 35 years in residential and commercial cleaning services. We use the industry's most advanced truck-mounted carpet cleaning system to remove ground-in soil and keep your carpet, tile and upholstery looking like new. Our hot water extraction process gets deeply embedded dirt other methods can't, and is the one most carpet manufacturers recommend for carpet cleaning and upholstery cleaning. Other methods, such as shampooing or dry foam cleaning, can damage carpet fibers, leave behind dirt and a sticky residue that can actually attract dirt. After injecting special cleaning solution and hot water, we then remove the dirt, cleaning solution and 95% of the water with our powerful truck-mounted system. Your furniture will be fresh and clean again for your family's comfort and protection. Tile and grout can absorb stains and spills just like your carpet. 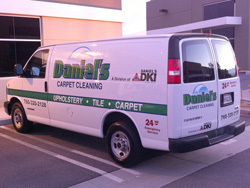 Daniel's Carpet Cleaning can help with your entire tile and grout cleaning needs. Our high pressure, truck-mounted cleaning system cleans extract even the deepest dirt and contaminants that lie within the pores of your grout. Our grout and tile cleaning services can handle your grout repair or grout color sealing needs as well. Sealing creates an invisible barrier to resist future dirt and spills and keep your tile and grout protected and looking its best.